To access the original experiment, click here. 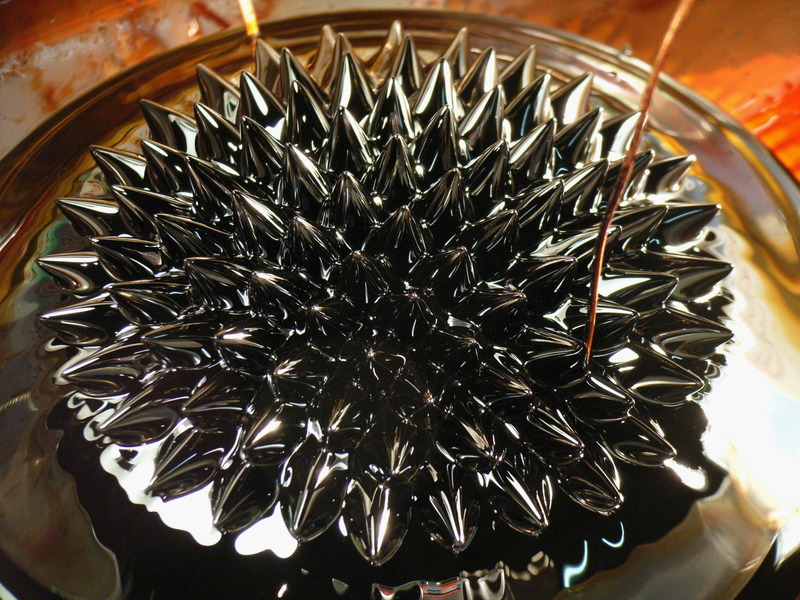 We’ve gazed the Observable Universe; we’ve melted metals with the heat of our bodies; we’ve painted with ferrofluids and Neodymium. All of these are but a very miniscule sample of what science can be. They’re not, by far, all of what science entails. This said, we have to address science critically, philosophically, and with humanistic sensibilities. Today we’ll talk about a very important topic in science: ethics. Science can open our minds; it can empower us to strive against chaos. But, unfortunately, this human endeavor has been used to commit atrocities. Will it happen again? Could we avoid the perils of science without ethical considerations? These questions should be part of any scientific curriculum. And the study of recent history provides perspective on the topic. Milgram faced a lot of criticism because of his experiment. Many respected researchers believed that it was unethical. What do you believe? Is it unethical? Does the experiment teaches us something about human nature? If so, what lessons would these be? After watching and discussing the video, ask yourself the following question: What type of person are you: the one that goes all the way to the lethal shock, or the one who stops and questions authority? This entry was tagged History, Science Club. Bookmark the permalink. I think that none of the parts of this experiment where unethical because they weren’t hurting any one. In some other perspective you might say it is unethical because the “teacher” was unknowingly getting recorded, but I think when you volunteer for science you have a very large possibility of getting recoded. In the end the people where told no one was actually getting shocked so i don’t understand what makes I unethical if none is getting hurt and no one is doing anything illegal. If I was put In this situation I would’ve stopped after 225 volts because the man was screaming in pain, though it was only a recording I’d be under the impression it is real in the expierment. Sometimes questioning authority is needed because I don’t know how someone can just go through with giving so much pain to someone. I believe that what was considered unethical at the time, was the fact that the subjects of the experiments were led to believe that they were causing harm to someone. Even when it was later revealed that no such harm was done, nevertheless, people were put through the experience, and it could be argued that that was enough to cause some sort of psychological harm on the subjects. Ethics is a very tricky subject. But I believe there is a consensus among the scientific community on what is ethical behavior. Human rights, as they are outlined by the United Nations, serve as guidelines for what could be considered ethical in regards to scientific research. I believe that if I were the person being experimented on (the teacher) I would find it unethical because of the fact that he was torturing the other person. But knowing that the experiment was all fake and no one was getting harmed i think it is ethical. Besides the volunteers although they didn’t know the real experiments the knew that it was a psychology experiment and psychology is all about twisting things and never seeing what is truly in front of you. If I were being experimented I think I would’ve stopped because torturing some one is inhumane even if they trick me to believe it’s for an experiment. This shows us that it’s not always correct to do what we’re told to do so. Follow your morals and go against things. This experiment was–and still is–very controversial. The scary part of it is that about 70% percent of the participants reach the end of the buttons. What does this say about human nature? Is it possible that what happened in Europe in the 1930’s and 1940’s can happen again? Do we truly learn from our mistake? Unethical or not, the true value of the Milgram experiment emerges from these questions; it gives us a lot to think about. Speaking of monsters, the historical context of the Milgram experiments was the trial on the monstrosities committed by Nazi War criminals during WWII. But a monster is not just the military arm of oppression. When we ignore the atrocities committed during our time, a lot of bad things can happen. Milgram wanted to understand how normal, civil people turned into monsters. Does authority and power–represented in the experiment by a white robe, but it could very well be a scientist, a priest, a head of state, a teacher, etc.–has to be obeyed at all times, without question? Under the mentality of saying “All for the sake of science” people could do and undergo harsh and cruel things. For me, this experiment targeted what people believe in and find ethical. Some continued even if they heard the “student” screaming and asking for the experiment to stop. Others found it completely unethical and decided to put a stop to it. Also, about how the superior figure influenced their decisions to continue to execute pain to a person they barely knew or not. Taking these decisions under stress and only by what a “professor” told them must have been extremely difficult. After completing the experiment, most would have taken it back, since they knew it wasn’t the right thing to do. Ones morality was a key factor in this experiment. I find it unethical for one to continue “torturing” someone for the sake of science. If I would have participated in the experiment, I think I would have been part of some of the people that put a stop to it. I find it horrifying how after various events in history that have involved torturing others because of orders from a higher power, the world hasn’t learned from them. The link for a clip of the original experiment is posted below. Many contemporary clinical psychology scientists believe this experiment to be unethical. It does brig up a lot of questions about human behavior, but not many answers. Thus, for many scientists, to continue with this experiment would be a morbid pursuit; a lot of people know the outcome, but nothing can be done about it. I agree with the modern scientific outlook of the Milgram Experiment. Nevertheless, it is important for us to know about history and science, and this post was a way of making a nexus between science, history, and philosophy (ethics). Immediately after reading this post the first thing I thought was that soldiers are a perfect example of ordinary people doing their job and causing harm. Soldiers are basically trained and forged to be killers, but can you really train a person for the consequences or the mental aftermath of being a soldier. Many soldiers during their active time kill like it is a normal every day thing, but when they come back to their home and sit down to reflect upon what they have done the gruesomeness of their actions begin to sink in. In this article we learn about Nancy Sherman’s experience psychoanalyzing around forty soldiers after they served their country. I feel that whether you would go on or not depends on your morals and your devotion to authority, if you are a person of a lot of morale, then you probably would’ve defied authority and just flat out refused to go on with the experiment due to the fact that you’d cause great harm or maybe even kill someone and your guilty conscience would probably eat you about it later. If you’re a person who’s devoted, trusting, or even scared of authority as the Nazis probably were, then you would’ve probably gone on with the experiment towards the end. However, with the Nazis it was entirely different. In this experiment, you weren’t being threatened with your life or the lives of your loved ones as the Nazis probably were during the war, you were simply being told by someone that the experiment required you to go on and being asked to continue, you weren’t being physically forced or obligated to continue or anything of the sort, which still gives you the option to simply say no and leave, even if it meant tarnishing the oh-so-important experiment. However, this still just goes to show that most people succumb to any form of authority. “[T]he power of authority, there were some teachers that hesitated but when the professor told them it was a crucial requirement for them to go on, they went on but with doubts and i think it was because they were kind of afraid of the authority” This is what is so chilling and scary about the outcomes of these experiments. Over 60% of participants went all the way. This means that WWII scale genocide in the future is still a possibility. I began to see it part of it unetichal the moment the “student” was yelling to stop the experiment and the “teacher” kept going, eventhough no one was actually harmed. I was surprised of how nine out of twelve people continued the experiment even if it meant breaking what some of them thought of as their morals just follow another person orders. Yet to get unthinkable results sometimes we have to do the unthinkable. Even when this experiment is highly unethical by today’s standards, I do think that it shows a lot about human nature. The results are quite scary. 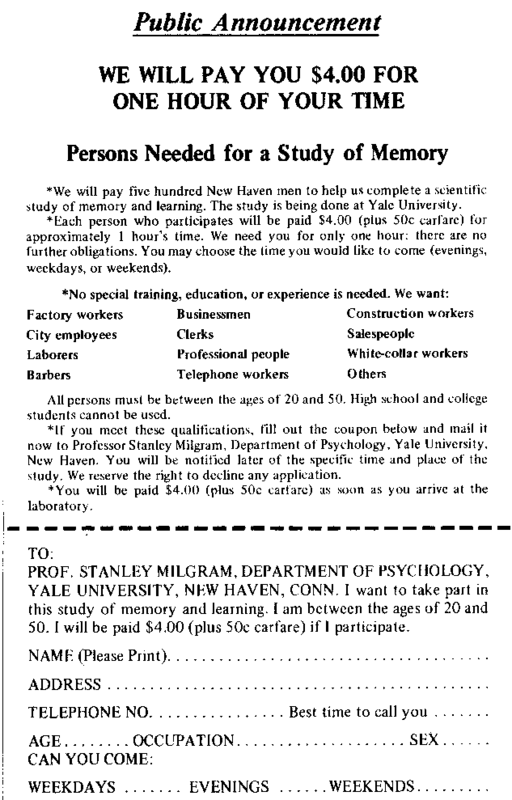 The Milgram experiment is a good way to think about many things, especially ethical considerations in science. I’m glad that you were able to comment here, Isabel.